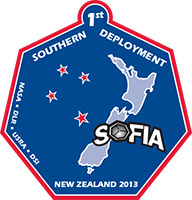 SOFIA will travel to Christchurch, New Zealand, from July 12 to Aug. 2, 2013, for three weeks of observations of the southern sky. The scientific targets for the southern deployment of SOFIA include the center of our Milky Way Galaxy, young stars, star forming regions, and supernova remnants in the southern Milky Way, the Milky Way's two satellite galaxies known as the Magellanic Clouds, and several nearby galaxies. As a joint project between NASA and the German Aerospace Center (Deutsches Zentrum für Luft- und Raumfahrt, DLR), SOFIA operates a telescope with an effective diameter of 2.5 meters in a modified Boeing 747SP aircraft and is thus the world's largest airborne observatory. SOFIA flies at altitudes as high as 13,700 meters (45,000 feet) to provide access to astronomical signals at far-infrared wavelengths that would otherwise be blocked due to absorption by water vapor in the atmosphere. WASHINGTON -- NASA's SOFIA airborne observatory will be based in New Zealand for the next two weeks, taking advantage of the Southern Hemisphere's orientation to study celestial objects that are difficult or impossible to see in the northern sky. SOFIA, formally known as the Stratospheric Observatory for Infrared Astronomy, deployed to the United States Antarctic Program's facilities at Christchurch International Airport last week and completed its first science flight at 4 a.m. local time July 18 (noon EDT July 17). A team of scientists, engineers, pilots and technicians from the United States and Germany are deployed with SOFIA to support as many as nine research flights through Aug. 1. SOFIA is a modified Boeing 747SP aircraft that carries a telescope with an effective diameter of 100 inches (250 centimeters). It provides astronomers access to the visible, infrared and submillimeter spectrum. On the first flight in New Zealand, astronomers used SOFIA to observe the disk of gas and dust orbiting the black hole at the center of our Milky Way galaxy, and two dwarf galaxies, the Large and Small Magellanic Clouds, which accompany the Milky Way. The Magellanic Clouds can be seen easily with the naked eye in the southern sky. "SOFIA's deployment to the Southern Hemisphere shows the remarkable versatility of this observatory, which is the product of years of fruitful collaboration and cooperation between the U.S. and German space agencies," said Paul Hertz, director of NASA's Astrophysics Division in Washington. "This is just the first of a series of SOFIA scientific deployments envisioned over the mission's planned 20-year lifetime." A vital part of the collaboration is a far-infrared spectrometer, the German Receiver for Astronomy at Terahertz Frequencies (GREAT). Mounted on SOFIA's telescope for the entire deployment, GREAT is especially suited for studies of interstellar gas and the life cycle of stars. "The success of the GREAT spectrometer in addressing exciting scientific questions at far-infrared wavelengths was demonstrated during SOFIA's earlier, Northern Hemisphere flights," said Rolf Guesten of the Max Planck Institute for Radio Astronomy in Bonn, Germany, and leader of the German researchers who developed the spectrometer. "Now, we are turning the instrument to new frontiers such as the Magellanic Clouds, including the Tarantula Nebula -- that is the most active star-forming region known in the local group of galaxies." SOFIA project scientist Pamela Marcum said the results anticipated from observations made during the aircraft's deployment will further scientists' understanding of star formation, stellar evolution and chemistry in stellar clouds. "The deployment exemplifies the synergistic relationship between SOFIA's international partners, with NASA playing a crucial role in the planning and execution of the science observations," Marcum said. SOFIA is a joint project of NASA and the German Aerospace Center, DLR. The aircraft is based at NASA's Dryden Flight Research Center's Aircraft Operations Facility in Palmdale, Calif. Dryden manages the program. NASA's Ames Research Center in Moffett Field, Calif., manages SOFIA's science and mission operations in cooperation with the Universities Space Research Association (USRA) of Columbia, Md., and the German SOFIA Institute (DSI) at the University of Stuttgart. The National Science Foundation's U.S. Antarctic Program provided vital support for SOFIA's deployment operations in Christchurch.